We cheer on any small business that makes it to their second anniversary—and most craft breweries count as those micro-scale enterprises that weave part of our cultural fabric. Pato Brewing, in Beloura, on the north side of Lisbon (between Cascais and Sintra), celebrated its 2o Anniversário (2nd anniversary) on Friday, November 9, 2018, with—what else?—free beer. If you weren’t lucky enough to attend, I’ll set the scene: a warehouse, newly scrubbed and painted, located in an industrial area known mostly for its high concentration of auto services and bike shops. 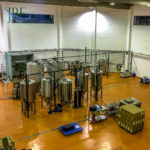 Actually, it’s a prime place if you want to start creating beer in increasing quantities—and that’s just why partners Grimoalda Soares, Tim Munnion, and Ramsay Wells have invested in their new facility, brewing their first batch there in May 2018. 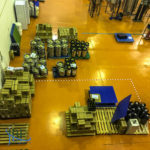 But they aren’t interested in joining those breakout Portuguese brands, like Musa and Dois Corvos, on the shelves of the Jumbo and the Continente supermarkets. Instead, they plan to expand upon the niche they’ve built working with special restaurants and bars that want approachable, food-friendly beers for their clientele. 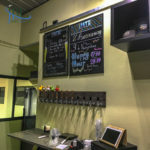 The partners work directly with these other small businesses to bring fresh beer by bottle or keg to local places in town. 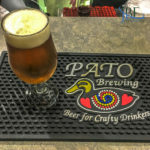 I first became acquainted with Pato beers during the Mercado da Cerveja Artesanal in Cascais back in August, and was impressed enough to buy a three-pack to take home with me to savor. And when their anniversary party popped up on my Facebook feed, I took the opportunity to go learn more. 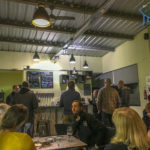 The tasting room’s upstairs, and set up for congenial happy hours with friends—no food is served, but you’re encouraged to bring in takeaway food from elsewhere. 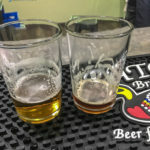 The current selection of five beers encompasses the brewery’s complete lineup, but Soares says that specialty beers are on the horizon. The board at Pato Brewing’s taproom lists the current lineup. Ducks on the tap pulls are a signature of the brewery. Yes, I went for a bit more Pipa, in a tulip to enjoy its aromas even more. The logo is a play on the Rooster of Barcelos, an icon of Portugal. The lineup ranges from the light and breezy Vapor, a California steam beer, to the rich Chinook brown ale. You won’t find wild combos, fruits, or milkshakes here—just straightforward beer that can be enjoyed with a meal or on its own. You can order tastes in small, medium, and large glasses, ranging from 2,20 to 4,00 euro a glass. 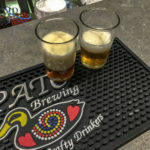 I began with the Patinho American pale ale, at 5,8% abv. Moderately bitter, at first it had not much in the way of aroma, then cloves came out as it warmed up a bit. Lime zest dominates the palate for a fresh take. It gave a very even impression as a good all-around ale. Next, I tried the Iron Duke Belgian amber ale, at 5,4% abv. A smooth ride, with plantain flavors and cherry aromas for me, I thought it would make a great summer refresher. The third beer on the lineup, the Chinook brown ale, was one I’d enjoyed before, at 4,5% abv. I waited a bit for the aromas to kick in, and when they did, they were distinctly coppery, a bit like sucking on a penny as it carried over to the palate. Mild coffee beans join that sense on the palate, with a touch of cream. My favorite of the evening, the Pipa IPA, comes in at 5,0% abv. With open florals and a sweet touch, I got canteloupe on the nose as well. The scent ran to honey, which continued onto the palate. Full-on butterscotch developed as the beer warmed, with a creaminess and a sweetness that balanced the bitter very nicely. Citra hops give this character to the brew, according to Soares. 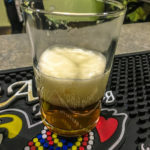 Finally, the Vapor steam beer, at 4,9% abv, a beer that had not impressed me, honestly, when I tried it at the festival. In this tasting, however, it came into its own, with bananas on the nose turning into banana cream pie on the palate. If you notice a sweetness and creaminess theme running through the Pato beers, I found that as well. 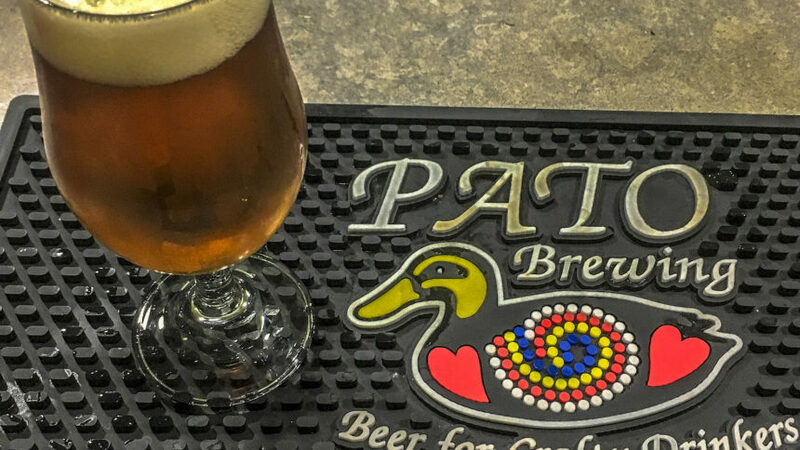 I look forward to finding Pato’s beers at my local foodie haunts, and anticipate what they’ll come up with next. They’re certainly on the right track—boa sorte e parabéns!